Rosh Hodesh is the first day of the moon cycle or next to it, and in its essence is like a seed of a tree that contains the knowledge, the DNA, of which the tree will grow according to. This allows us to understand how or why our actions at the beginning of the month can influence the whole month. The Kabbalists teach us how to draw blessing and prosperity and how to achieve more control of what will happen to us during the next month with special tools such as awareness, intention and other actions. In fact, almost every Rosh Hodesh is recommended as a positive day in which we can start new things (In his interpretation to Sefer Yetsira (The Book of Formation) Rabbi Shabtai Donolo explains that the first half of the month is recommended for new beginnings. The Book of Formation (Sefer Yetsira), of Abraham the patriarch, teaches us that the Hebrew letters can be used as tools in order to transmit spiritual abundance. Every month is influenced by two letters – one controls the planet that controls the month and the other controls the astrological sign of the month. Using meditation and Kavanah (Meditation and awareness), we can use the letters of the month in order to cause an abundance of positive forces for the whole month. It is recommended to use the letters of the month for every day meditation for the whole month, starting on Rosh Hodesh. 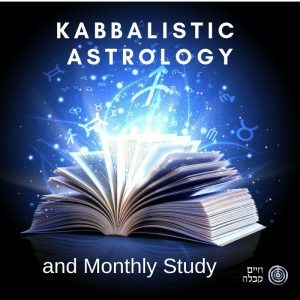 To hear an audio lecture about Kabbalistic Astrology and Monthly Study you can enter the Live Kabbalah University.